The dollar was underperformed against the G10 currencies and EM currencies as well on the dovish FOMC meeting. The tradable dollar index (KTM: USDX) fell 0.40%, and 10y Treasury yields closed at 2.58 vs. 2.61 Tuesday’s closing. 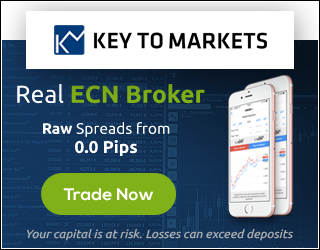 Save haven currencies CHF and JPY up by 0.70% each along with one of the European currency SEK by 0.75%. Besides commodity currencies, AUD and NZD up by 0.35% each but CAD closed with 0.15% respectively. Turning to majors euro up by 0.6% but the pound down by 0.60% on the Brexit deadline noise. Turning to the emerging market currency space, we have a couple of heroes on Wednesday’s trading session. The South African Rand up by 1.60% followed by the Mexican Peso by a percent and Turkish Lira by 0.90% respectively. In commodities, Platinum is the superhero with 1.80% on the board followed by Brent oil with 0.90% and Gold and Silver by 0.6% each. Back to the subject of FOMC meeting, the market focus on changes to the dot plot. FOMC median dot plot shows no hikes in 2019 and one hike in 2020. The FOMC also announced the committee intends to conclude the reduction of its aggregate securities holdings in the System Open Market Account (SOMA) at the end of September 2019. 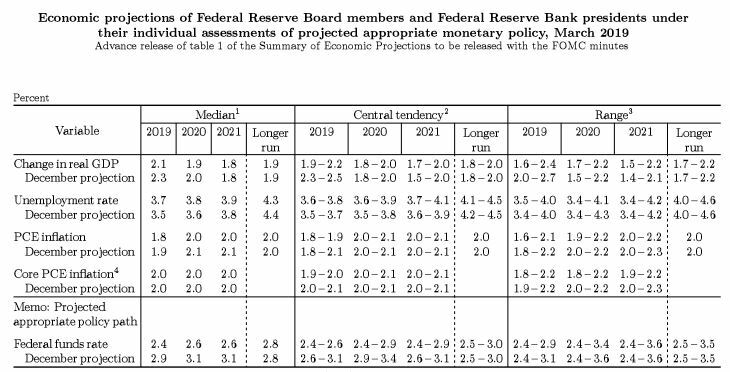 Turning to the economic projections of Federal Reserve Board members, the median GDP growth moved down for 2019 and 2020 whereas unchanged for 2021. Besides the inflation too moved down whereas the unemployment for the same period moved higher. Median GDP: March projections 2.1, 1.9 and 1.8 respectively vs. December projection of 2.3, 2.0 and 1.8. Inflation: March projections 1.8, 2.0 and 2.0 vs. December projections of 1.9, 2.1 and 2.1 respectively. Unemployment rate: March projections 3.7, 3.8 and 3.9 vs. 3.5, 3.6 and 3.8 for 2019, 2020 and 2021 respectively. 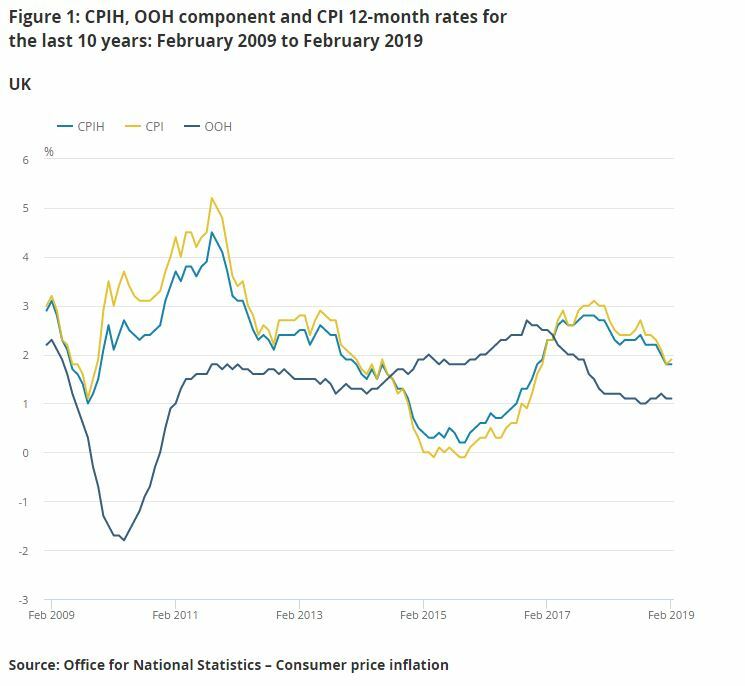 In terms of macro data from yesterday, the UK CPI up 1.9% in February 2019, from 1.8% in January 2019. This morning in Asia, Stats NZ reported that, NZ GDP up 0.6% in the December 2018 quarter. This rise follows a 0.3% increase in the September 2018 quarter. GDP grew 2.8 percent over the year ended December 2018. 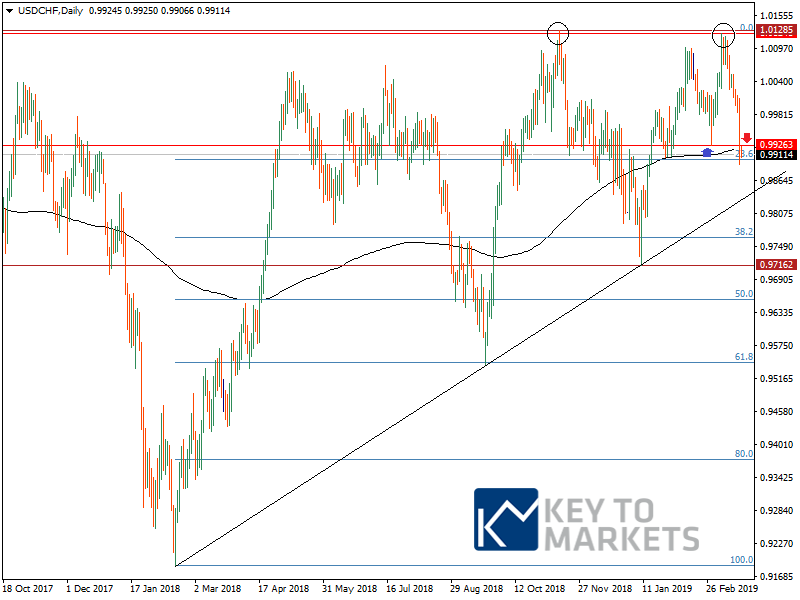 Looking at the day ahead, it’s another reasonably busy day for data highlights by Aussie labor market summary, SNB monetary Policy review, UK Retail sales, and BOE Monetary Policy review and EU summit in focus. Closed below 200MA for the first time since mid-January 2019. Support finds at 0.99-0.9870 below here focus shifts to 0.9845 and 0.9800. Intraday resistance seems to be at 0.9930 above here could squeeze towards 0.9985-1.0000 levels. We expect a limited down risk ahead of the SNB policy meeting today. It is important to always keep in mind the risks involved in trading with leveraged ins8truments. 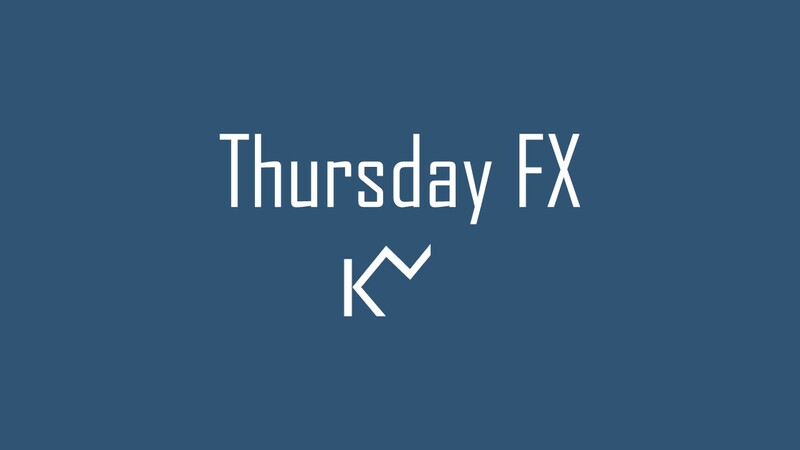 Friday: FX focus on US consumer sentiment and Canada CPI.